Go behind the scenes with the authors of fascinating books we’ve recently read for insights on how they came up with the storyline and characters, tales from the writerly life, researching the topic and whatever we can glean about our newest reading obsession. The Entertainment/Literature/Biography (ELB) blog regular posts about the Library’s wealth of information on sports, film, theatre, literature, poetry and an extensive biography collection. This room located in Central Library also houses the Library’s Zine collection. The Fine Arts Room blog regularly provides information about newly acquired books, special services, and programs. Occasionally descriptions of the art and architecture of Central Library, programs of other rooms and branches, and other news about SLPL is posted. Genealogy Room News provides information on book and microfilm materials of likely interest to genealogists, genealogy reference databases, and programs offered by Genealogy Room staff. St. Louis Public Library’s Grants & Foundation Center (GFC), located in the Social Sciences Room at Central Library, is a mini-nonprofit library with books and periodicals that range from philosophical explorations of philanthropy to practical guidance on how to run your nonprofit as well as resources to assist nonprofits to identify possible grant funders. Check out the blog for periodic updates about GFC goings-on, including programs offered at the Library and training available in the St. Louis region. The GFC is a Foundation Center Funding Information Network partner. The History and Languages Room blog regularly provides information about current events and history, as well as posts about our extensive history collection. 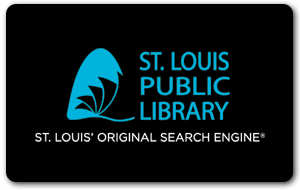 St. Louis Public Library has been a resource for patents and trademarks for over 100 years. Get today’s information here for entrepreneurs, inventors, and those interested in intellectual property. Welcome to our blog that features stories behind SLPL’s noteworthy collections of printed works, manuscripts, photographs, maps and our own institutional archives. In addition, we follow recent happenings in the rare book and manuscript world. Welcome to Central Library’s Science and Technology blog! You’ll find everything from scientific breakthroughs, cooking tutorials, genetic research, pet ownership, business practices, gardening and more in the Science and Technology room and we blog about it all right here! Take a peek inside our blog and open our mind to the world of science and technology! Schlafly Gatherings explores the cultural offerings of the Library and the Central West End in books, events, music and film. Library staff gathers the offerings of the Library and explore new books, film and music as well as highlights events at Schlafly and throughout SLPL. Welcome to the Central Library’s Center for the Reader blog. You’ll find information here about our different book discussions, author information, book awards, reading lists, and much, much more. We know you’re passionate about reading, and we are, too! The Center for the Reader is the place to find fiction! The Social Sciences Room at Central Library might more accurately be referred to as the “ology” and “isms” room – here you’ll find books on astrology, psychology, mythology, sociology, anthropology, and ecology as well as racism, feminism, sexism, journalism, Judaism, Buddhism, capitalism, nationalism – even cannibalism. Visit our room to explore 001-399 of the Dewey Decimal System which also includes computers, religion, philosophy, the occult, law, true crime, & etiquette, to name but a few. Visit our blog to learn about new books, how our collection relates to events in the news, and things that catch our fancy. Get young adult book recommendations from staff and teens or submit your own review. Learn about library resources and upcoming teen programs. Recommendations and resources for parents, teachers and caregivers from SLPL youth services librarians and staff. Welcome to the Studio! We house the film and music collection of the St. Louis Public Library’s central branch. With over 20,000 CDs and over 4,000 DVDs in The Studio, you’re sure to find something you like. Come take a look at local St. Louisans through a literary lens. What Are You Reading, St. Louis? is asking the trailblazers of this city what books make them tick, move them to tears, and inspire their work. If you are someone or know someone who influences the life and culture of the Lou, we want to interview you! Contact Chris at clabarbera@slpl.org for more information.